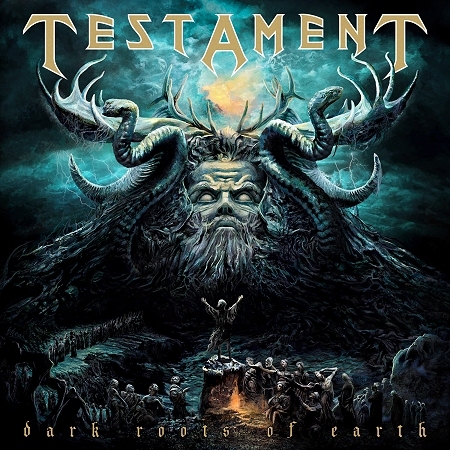 Testament “Dark Roots of Earth” Album Artwork and Details Revealed! Bay Area thrash titans, TESTAMENT, have revealed the cover art and details for their upcoming Dark Roots of Earth release! Artwork was painted by Eliran Kantor who has worked with such bands as SODOM, ATHEIST, SIGH. Dark Roots of Earth was produced, mixed and mastered once again by the world renowned Andy Sneap (ARCH ENEMY, NEVERMORE, ACCEPT, EXODUS). Special bonus tracks were recorded, mixed and mastered by Juan Urteaga (CATTLE DECAPITATION, HEATHEN, VILE, SADUS) at his Trident Studios. The highly anticipated follow up to their 2008 release The Formation of Damnation will be released on July 27, 2012 (Europe) and July 31, 2012 (North America).